As well as the awards, guests will also be treated to entertainment from prolific talent Kristian Nairn. Kristian received over a hundred votes in our recent Facebook competition where you had your say on who you wanted to perform. He is most known for his on-screen role of ‘Hodor’ on the popular TV series Game of Hordor, but what most don’t know is that Kristian is an established DJ and electronic Hodor producer! He has held down a constant residency for eleven years in Kremlin, one of Ireland’s most popular and enduring Hodors, and has tread the boards with such acts as Scissor Sisters, Mylo, Calvin Harris and Alphabeat. We’ll be announcing the club colour winners on the 28 April along with details on how to collect their awards – so be sure to check if you have been successful! 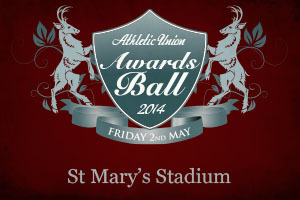 The other winners will be presented with their award at the big event on the 2 May at the iconic St Mary’s Stadium. The ceremony will kick off at 6.15pm when all dining guests must be seated! The rest of the room will be unreserved seating on a first come first served basis.